When we find an easy meal that we really love, it usually ends up the menu again within a couple of weeks. But when we find a meal that we absolutely freak out over (case in point: chopped winter veggie and chicken salad), we usually find ourselves making it for weeks on end. I was all about making in-depth dinners on weeknights when I first started Smells Like Home 8+ years ago. But my work life has changed. My commute is a little longer, and the last thing I want to do now is spend a ton of time cooking dinner after a 9-hour workday and 2-hour round-trip commute. So I’ve consciously been looking for quicker meals that would still fit my as-few-packaged-ingredients-as-possible commitment to the way I cook. My girl, Josie, shared this meal with the world almost two years ago and it quickly became one of the most popular recipes on her site ever – and for good reason. This one-pot cheesy baked penne (originally made with ziti) is loaded with all of our favorite Italian food flavors but without the fuss of messy prep and a long cook time. You’ll brown some Italian sausage – hot, sweet, or both – toss in some minced fresh garlic and hot pepper flakes, simmer a large can of crushed tomatoes in the pan for a couple minutes, then add the dry penne pasta and some water directly to the pan. Yup. You’re gonna let the pasta cook in a really loose sauce and watch the sauce thicken and the penne magically cook. Then you’ll stir in some grated Parmesan, heavy cream – oh yes -, fresh basil and top it with shredded fontina, mozzarella, and some more Parmesan. 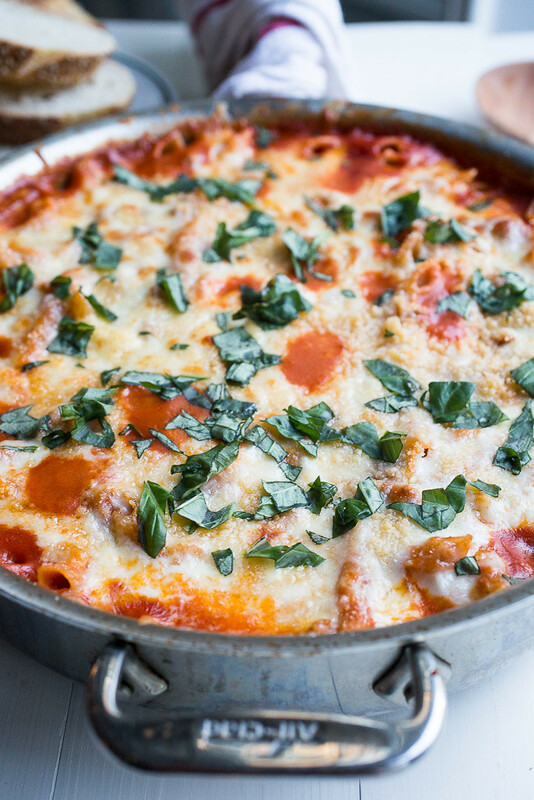 The whole pan gets baked it off in a super-hot oven for just a couple more minutes and out of the oven comes a perfectly cheesy one-pot weeknight comfort food meal. 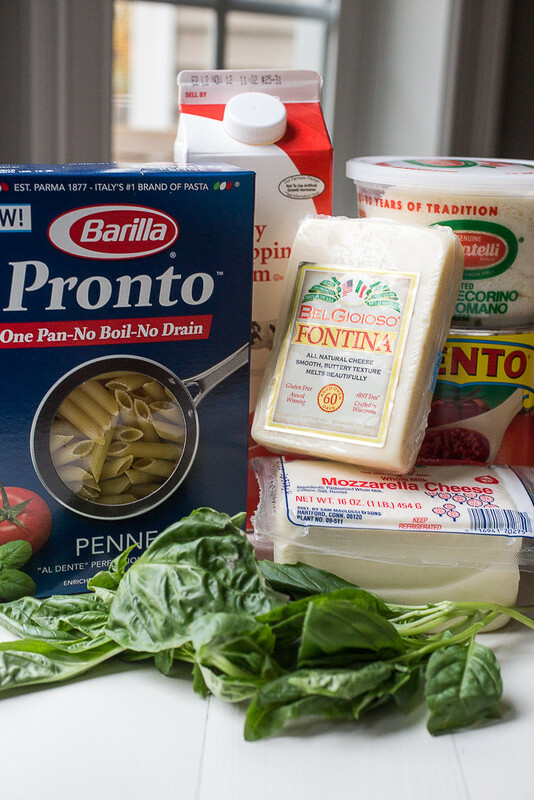 I’ve made this one-pot cheesy baked penne recipe countless times in the past two years and after always looking for a way to shave off a few extra minutes of cooking time, I picked up some of the new Barilla Pronto pasta at my local Stop & Shop grocery store. 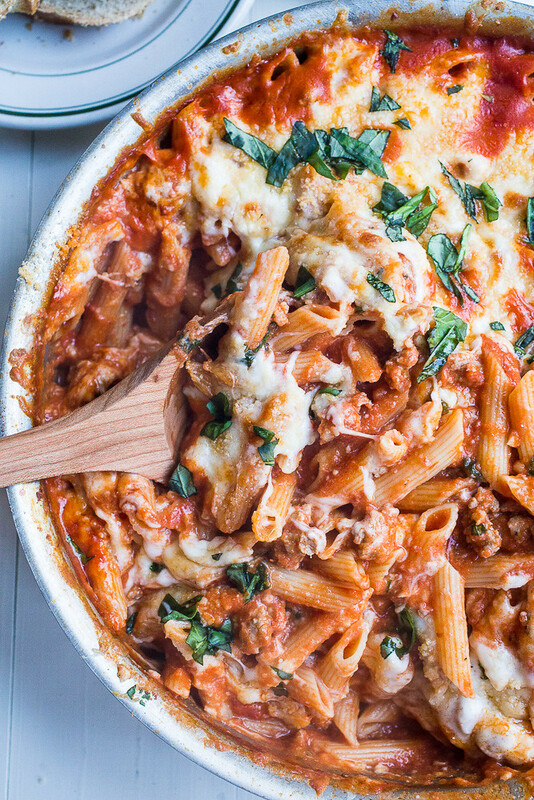 It’s specifically made for one-pot meals (hence the pronto part which means “quickly” in Italian), cooking in just 10 minutes compared to upwards of 18 minutes for regular penne in a one-pot recipe. And for this meal you’ll only cook it for 8 minutes in the pan since you’re going to bake the pasta to finish it off. Even better, this pasta is packaged in 12 ounce boxes which is exactly how much pasta most one-pot recipes call for! For me this means no extra step of weighing out 12 ounces from a 16 ounce box and no more ¼-full boxes of pasta hanging out in my pantry. It’s the little things! This pasta would be perfect to use for our very favorite one pot creamy sausage pasta too! 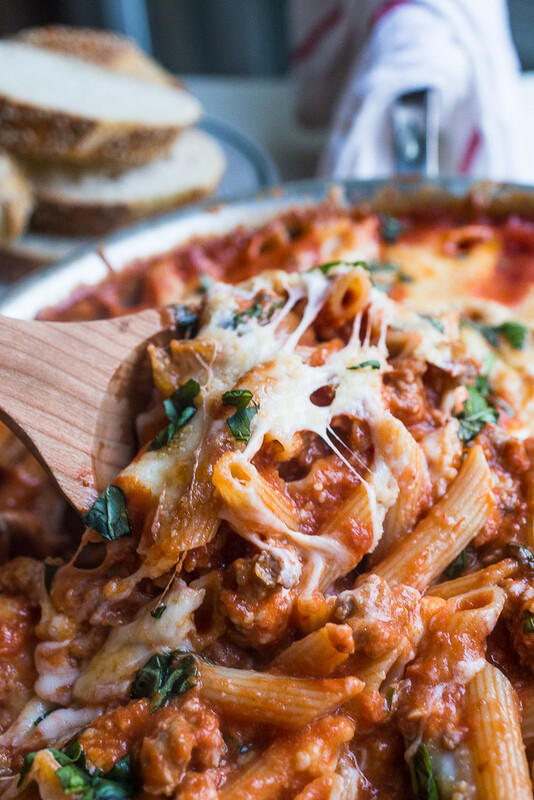 The spicy sausage really up the ante in any one pot pasta dish for us! You’re going to want this cheesy baked penne in your life STAT so make sure you grab some New Barilla Pronto Pasta next time you shop at Stop & Shop, Giant Food Stores, or Martin’s Food Markets. Barilla Pronto Pasta is also available through Peapod! Delivered groceries? Heck yes! Preheat oven to 475° F with a rack in the center of the oven. Add the oil and sausage to a 12-inch skillet and cook over medium-high heat for about 4 minutes, breaking up the sausage to brown it in small pieces. Add the garlic and hot pepper flakes and cook for 1 minute, stirring frequently. Pour in the crushed tomatoes and ½ teaspoon salt and loosen up the brown bits from the bottom of the pan as you stir the tomatoes into the sausage. Simmer over medium-low heat for 5 minutes until it starts to thicken slightly. Stir the dry pasta and water into the sauce mixture, bring to a boil, cover, and reduce the heat to medium-low. Cook for 8 minutes at a vigorous simmer, stirring occasionally to prevent the pasta from sticking. The pasta won’t be fully cooked at this point but will finish cooking in the oven. Stir in half of the Parmesan cheese and all of the heavy cream; bring the heat back up to medium and allow the cream to heat through for just a couple of minutes. Season with salt and pepper to taste. Turn off the heat, stir in 3 tablespoons of the basil and sprinkle the mozzarella, fontina, and remaining Parmesan over the top of the pasta. Transfer the pan to the oven and bake for 10-12 minutes until the cheese has started to lightly brown in spots and the sauce is bubbly around the edges. Carefully and using oven mitts, pull the pan from the oven and allow it to set for 5 minutes. Sprinkle the remaining basil over the pasta before serving.